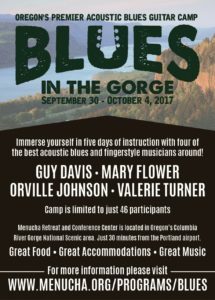 This coming September, the fourth annual Blues In The Gorge acoustic blues guitar camp will return to the Menucha Retreat & Conference Center. 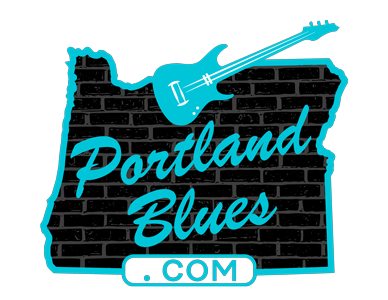 Presented by Menucha and co-sponsored by the Cascade Blues Association, this year’s instructors will feature world-renowned artists Guy Davis, Mary Flower, Orville Johnson, and Valerie Turner. Guests will immerse themselves in music, enjoying up to four workshops each day, with instructor concerts and jams each night. It’s not too early to register as participants are limited to only 46 to ensure plenty of instructor attention for all. Happening September 30 through October 4, Menucha Retreat & Conference Center is located in Corbett, Oregon in the beautiful Columbia River Gorge, about 30 minutes from Portland. Registration is open at menucha.org/programs/blues.